A completed substructure in a home in Duxbury. All the work was done from below without disturbing upstairs. 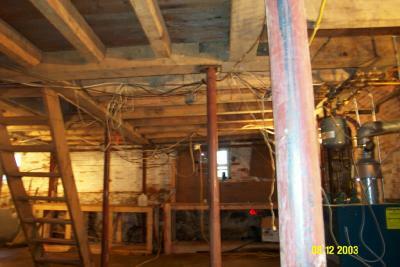 This work corrected the house sagging and the rotted beams. ….. The evaluation of post and beam structures takes a specific body of knowledge and a lot of direct experience working on homes and barns. If you have structural concerns, then you should have an expert specializing in this field evaluate them. …. We have done sill and substructure work on houses old and new. …. We use real beams with pockets and mortises cut out to join with the floor structural members. We would strongly oppose the use of 2x8s along with the lack of skills and knowledge that would seem to coincide with it. 2x8s do not provide the long term structural needs of a post and beam building. This type of repair could also decrease any future potential sale. …. Structural damage is difficult to access and observe in some instances. There may be some unknowns even with an expert’s In fairness to the home inspector, they have to know a little bit about all the components of a house. They most likely have not done extensive structural work on a variety of buildings. I would recommend that you have Colonial Restorations, LLC evaluate the structure. We also strongly recommend a home inspection to look at your house before you buy. We have never had anyone have to move out as far as the structural work goes. In some cases, parts of the house would be blocked off but generally it is not a concern. We do charge a fee for a site visit which depends primarily on the location of the property. Some people expect free estimates. There is really no such thing. The cost is either figured into the job, or worse, you’re getting a company that is desperate for work. Colonial Restorations, LLC is a second generation company whose love of older building is evident. Be certain that if you hire someone else that the owner is on-site doing the work. There are lots of horror stories out there about hiring a company only to find out you only see the owner on It’s also critical in this economy to watch out for contractors so desperate for work that they say they can do structural work when they have little or no credible experience. If you feel that the structure of the building(s) is a factor in determining whether you should go through with the purchase, then Colonial Restorations, LLC would be a good choice. With over 38 years of experience doing structural restoration, we will most likely be able to give you a better evaluation of the building. We can also write an estimate for which we will actually do the work. However, if you feel the other systems (electrical, plumbing, etc.) are more of a concern, than a traditional home inspector may be the way to go. Many people who are serious about purchasing an older home actually have us visit the property in addition to a home inspector. Ultimately the company that you choose to evaluate the structure should be the contractor that you would choose to do the work. It makes no sense to pick a contractor whose site visit fee is minimal/free if you feel another contractor would do a better job on the actual work. You should avoid opinions from non-experts who say that they know someone who knows someone that may have done a sill job years ago. It’s best to go with a company that specializes. Especially in this economy, it is very important to remember a lot of contractors are out of work and say that they can do structural work even if they have no experience.